– Line a 15x10x1-inch pan with parchment paper, and leave the ends extending over the shortest side of the pan. Spray the parchment with cooking spray or brush with oil. Set pan aside. – Fry off your bacon and crumble or chop it up, and keep warm while you prep the rest of the ingredients. 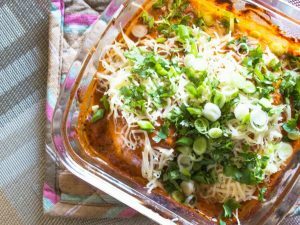 – Slice the red pepper and green onions, and put in a bowl. – Beat the eggs in a large bowl, then add the milk and flour. – Beat again until blended. – Stir in the bacon, peppers, onions and the oregano. – Tip carefully into the pan. – Place in the oven for 14 to 16 minutes, or until the edges are almost set. Put the cheese evenly over the top and bake for 2 minutes, or until the cheese has melted. 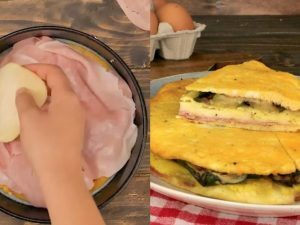 – Once the omelet is out of the oven, use the overhanging parchment paper to help gently roll the omelet up on the short side. Remove the paper, and place carefully on a platter. – Cut into slices, and serve with salsa. 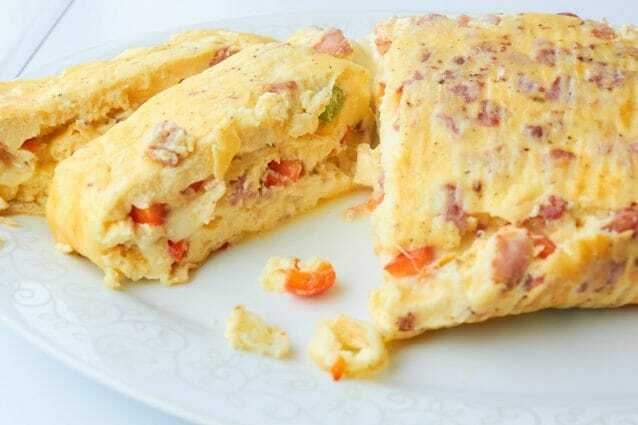 Baked omelet: here’s how to make it fluffy and tasty, you'll surprise everyone!